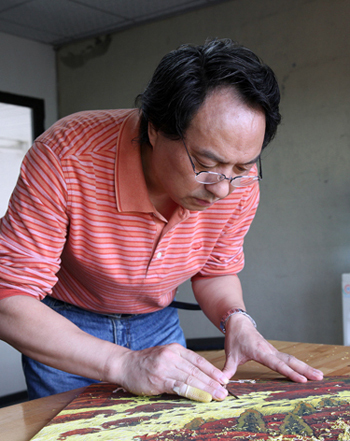 A professor at the Fine Arts Institute of Sichuan Normal University in Chengdu, Sichuan, where he researches and creates his remarkable black-and-white woodblock prints, Silou is the first visiting artist at UCSC’s new Contemporary Print Media Research Center. This will be his first solo exhibition on the West Coast. As part of a month-long residency on campus, Silou is also working on woodblock prints in the center’s newly created visiting artist studio, where UCSC students are participating in his project and workshops. 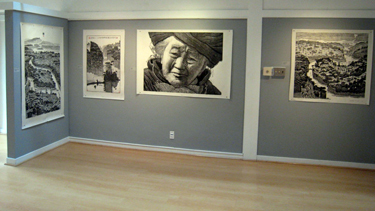 “When I first saw Xiang Silou’s art in a solo exhibition at the Guanlan Original Printmaking Base in China while I was on a residency there in 2012, I was struck by the extraordinary richness of his large woodblock prints,” said UC Santa Cruz art professor Jimin Lee. 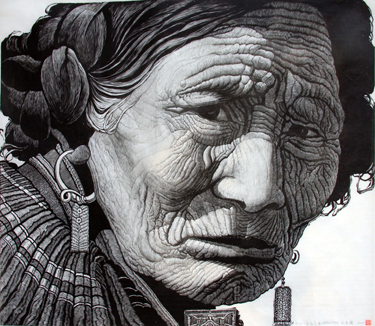 Silou is known for his large-scale, intricately detailed portraits of faces, particularly of elderly people from ethnic minorities of China. The Contemporary Print Media Research Center is one of several research centers in the Baskin Art Department. Through its new visiting artist program, UC Santa Cruz students will be able to interact and participate in each visiting artist’s projects. Lee said that the center will continue to bring in visiting artists from different cultural and social backgrounds to benefit UCSC art students. Sesnon Gallery director Shelby Graham noted that Silou spoke to a packed audience of students, faculty and community members at the gallery last night about his creative process. 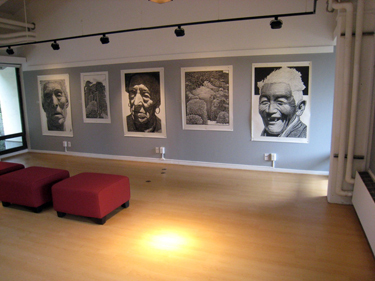 “This exhibition provides a great opportunity for alumni to visit Porter College over the weekend to see these spectacular hand-printed woodblock portraits,” said Graham. “At the same time, they can also check out the Art Department’s faculty exhibition now up in the Sesnon Gallery,” she added.